Make Money App – We live in the era of the smart phones. We use smartphone for entertainment, playing games and for work. However, smart phone can be also used for making extra money. Check out these 7 Best Make Money App for making extra money or saving extra money in your spare time. 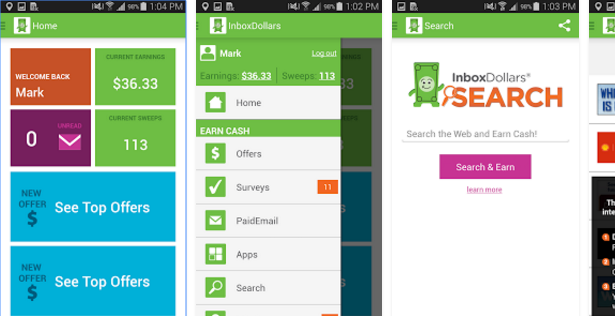 Inbox Dollars is money making app. It is a legitimate app that pays cash for doing various activities online. The activities are like reading email, downloading apps, taking surveys etc. How InboxDollars can help you in money making? Payout threshold is $33. It means when you reach this limit you will get money by cheque. Earn money is second best money making app. You can make money using Earn Money by completing small tasks such as viewing advertisement, visiting webpage, completing surveys etc. You will get paid in rupee for completing the tasks. How to make money using Earn Money? Download Earn Money app and install it in your smartphone. Register using your email id and password. Click on Earn and you will able to see various tasks/offers. Once you Complete the task money get deposited in your Mobikwik account within 24 hours. You will also get unique reference code you can share this code and earn extra Rs 20 for every new referral signup. You can redeem this money for paying various bills or recharging your mobile balance. Field agent is US specific app. This app allows you to earn money online for completing small jobs. These jobs are like collecting information or filling up surveys. How Fieldagent can help you in money making? If you love clicking photographs. This app is for you. You can straight away sell your photos and make money using Foap. Foap is completely free app. You will get minimum $5 for each photo. How to use Foap for money making? Download Foap app and Install it on your smartphone. Create your portfolio and upload photos for sell. If photos are sold you will get money. You need to integrate Foap with PayPal account. So, turn your passion and make money by photos. Champcash is a referral based app for earning money. In order to earn cash using Champcash you just need to refer to someone about this app. You can refer to unlimited friends and earn maximum money. How to use Champcash for making money? Download Champcash and Install it on your smartphone. Signup and enter reference id of your sponsor. Go to Invite and Earn Menu. Refer to your friend and earn money. 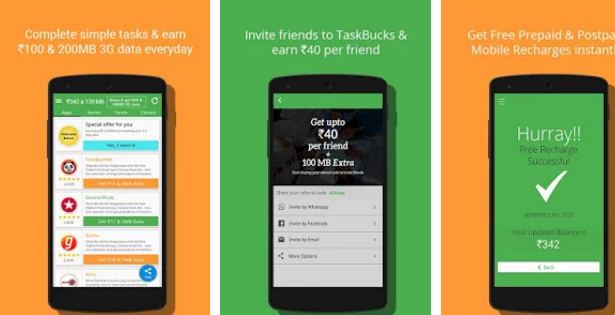 TaskBucks is app that provide you extra money for completing simple tasks. You can earn money starting from Rs 100. Apart from this you can also earn money by referring to friends. TaskBucks also offers fee mobile recharge, free Paytm Cash and various offers on Ubar, Book My Show etc. MOBROG is research based app that pay you money on completion of surveys. You need to fill up answer for simple questions about existing products or services to complete these surveys. How to use MOBROG for making money? Take a part in surveys and get paid for your opinion. You will be able to make Rs 30 to Rs 250 per survey. I hope make money app mentioned above is useful to you. Anyone with smartphone and some basic knowledge can make money out of these apps. So, what are you waiting for download these apps and start making money. Do you use any other smartphone app to make money? If yes do share it in the comment section.